A robotic sidekick could soon be helping field engineers fix faulty equipment in remote locations. Developed by IBM, the robotic helper has a projector that can overlay information on equipment to guide remote repair work. Supervisors and experts back at base can also look and talk through the projector to oversee fault fixing. In addition they can sketch diagrams, use a laser pointer or run videos to aid employees in the field. The Mobile Repair and Operations (MRO) prototype has been built to help maintenance workers who are often called on to find and fix equipment on large industrial plants they have never visited before. The innovation – which pairs a GPS-equipped smartphone with a robot arm – can guide engineers to the right location using augmented reality. The phone’s screen acts as a window on to the augmented world overlaying it with arrows, signs and other cues to help navigate through an industrial plant to the faulty equipment. 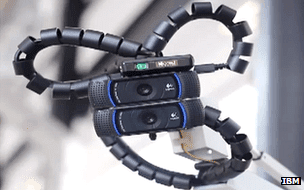 If needed, staff in a control centre can see and hear everything the field engineer is seeing and hearing via the camera and microphone mounted on the robot arm. They can also guide the arm to get a closer look at what is broken or use its in-built projector to give advice. This could be in the form of video guides that take engineers step-by-step through repairs or via freehand sketches that can can be projected on flat surfaces. In addition, the arm has an in-built laser pointer that can show exactly where on a machine work should start or where parts should be placed.